The BlackBerry device is a wonderful thing. We load our BlackBerries with various softwares and applications to increase our productivity and customize them with interesting themes and ringtones. We watch movies and play games and track day to day activities. All of these things require passwords and usually involve storing data on our devices that is sensitive in nature. 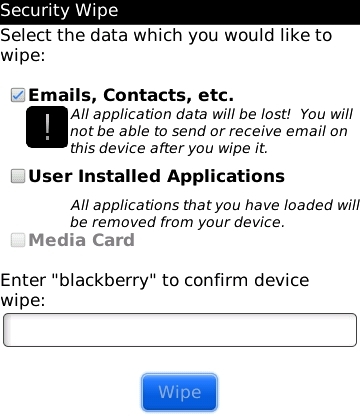 So what if you want to wipe your BlackBerry clean? There are a number of reasons why you might want to wipe out your Blackberry. Perhaps you have switched jobs and need to submit your BlackBerry into your new IT department so they can set it up for their network. You wouldn’t want them to have access to your previous employers data would you? Perhaps you have purchased a new model of BlackBerry and would like to gift your previous model to a friend or sell it on ebay. The same rule applies, you do not want them to see what you were using your Blackberry for prior to handing it over. How to Use security wipe ? Before using this function, it is recommended that you back up any data and applications that you like to use on your new BlackBerry smartphone. On the BlackBerry smartphone, select Options from the home screen. Select Security Settings, then Security Wipe. Specify what items will be wiped during this process by checking off the boxes. Enter “blackberry” (field is not case-sensitive) and select Wipe. The BlackBerry smartphone will reset a few times, and after this process is complete, it will no longer contain any of your personal data.